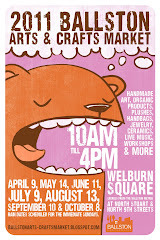 Ballston Arts & Crafts Market TOMORROW - July 10th! Woot! Woot! Guess what TOMORROW, Saturday, July 10th is! Yep-- it's the Ballston Arts & Crafts Market! And I can't think of a better way to spend a Saturday afternoon than with a laid-back stroll through pretty, tree-lined Welburn Sqaure. From 10:00am - 4:00pm, check out your favorite returning artists and newcomers alike. Plus, this month, St. Coletta of Greater Washington is joining us! St. Coletta Shops will on hand to offer a variety of crafts by artisans with intellectual disabilities. Crafty Drinks Are Here Again! Izakaya (居酒屋) A type of Japanese drinking establishment which also serves food to accompany the drinks. The food is usually more substantial than that offered in other types of drinking establishments in Japan such as bars or snack bars. They are popular, casual and relatively cheap places for after-work drinking. Come and beat the heat with us this Tuesday with Asian-inspired cocktails and sushi at Kushi Izakaya Gastropub!